Halloween is the perfect time to get creative with treats, and as you prepare for all of the Halloween festivities, here is a sweet, yummy, and customizable treat that you can feel good about giving to your family! This delicious and easy 5-ingredient Caramel Apples recipe skips the dairy and corn-syrup usually found in store-bought caramel. So, you don’t have to worry about serving an overload of inflammatory ingredients! Plus, this recipe is completely customizable, so have fun with it! You can top these caramel apples with your favorite toppings and save any extra caramel for up to 2 weeks for other fun Halloween goodies! In a saucepan, bring coconut milk and maple syrup to a boil over medium-high heat. Be sure to stir frequently to make sure it doesn’t burn. Once at a boil, reduce to a simmer and let boil until reduced to desired consistency (this will take at least 30 minutes for it to begin to thicken and may need longer depending on how thick you would like). Stir occasionally to continue to keep from burning to the bottom. Once to desired consistency, remove from heat and stir in coconut oil and vanilla. Stir occasionally to keep coconut oil incorporated. 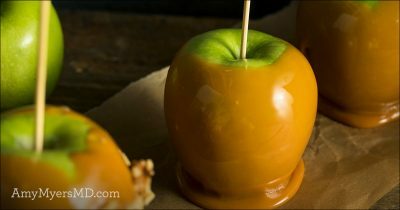 Once at room temperature, drizzle caramel over or submerge apples in caramel. Place on parchment paper and let chill in refrigerator.